♦ TODAY! Wed., January 18, 2017 – The Twilight Project. 12:30 to 1:20 PM. Carlson Theatre, Admission free. Click here for more information. ♦ 2017 Art Department Faculty Exhibition. The show runs from Jan. 11 – Feb. 8. The gallery is open: Tues./Thur. 12-2:30 and Fri. 11-2:30. ♦ SYLLABI! Thank you to all the instructors that have submitted your syllabi links for winter 2017. All other faculty remember to use Gordon Leighton’s syllabi template which includes all the new updated links and information. Please note that syllabi should be ADA compliant. 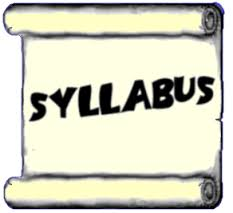 Click here for a reminder of how to mark your syllabi “public” and send your syllabus link for posting. ♦ Winter 2017 office hours. Thank you to all faculty that have submitted office hours to Jon. However, there are a few instructors that haven’t done so. Please send your office hours to Jon Kissoondyal . He is asking for: time available to students, office location, office phone #. We need this info up at the front desk for students, staff and faculty inquiries. 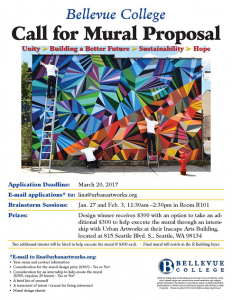 ♦ This opportunity is for Bellevue College Students only. Deadline for Entries: March 20. Mural Themes: Unity – Building a Better Future – Sustainability – Hope. Please visit the A&H R Building Mural Project info site for more information. ♦ Please congratulate Zach Wunder (Sound Design) and Tim Bartz (Stage Management) for their Meritorious Achievement Awards from the Kennedy Center American College Theatre Festival for Coupler. ♦ Fri., Jan. 27, 2017 – The Bellevue College Pacific Vocal Jazz Festival 2017. Friday, January 27, evening concert tickets available through Brown Paper Tickets. ♦ CHOP SHOP Bodies of Work: two FREE community classes offered on Sunday, January 29 12:00-2:pm in the Bellevue College Stop Gap Theatre. Classes are offered through Stage Fright Student Drama and StoneDance Productions. 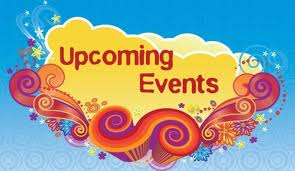 Please read more about these classes on the A&H Commons site.